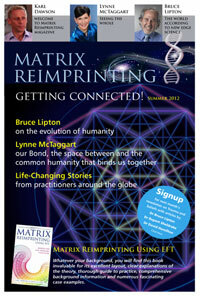 Matrix Reimprinting have announced the launch of their new online magazine. The multi-media publication is filled with interesting life changing stories, and a multitude of videos which will keep the reader engaged and informed. Matrix Reimprinting founder Karl Dawson said "We are very excited about the launch of the magazine which will become a regular feature. Matrix is growing quickly and we wanted to both keep people informed and show people how effective the technique truly is". The magazine also includes multi-media articles by Bruce Lipton PhD and Lynne McTaggart. this can be described as the Glossy version of an online magazine - one not to miss!